1 – overnight temperature in central Sheffield last night (!). 1 – thousand pounds raised via the donations page. Fantastic progress and sincere thanks to all who’ve donated: it will make a real difference in what we can do. 1 – chick hatched late afternoon today (just visible in screengrab below)! So one day early against my estimates. More detailed update to follow over the weekend. 2 busy to do this last night! 2 – successful urban breeding pairs in the SBSG recording area last year. 2 – successful breeding attempts in the whole of the Dark Peak area of the Peak District, prime Peregrine habitat, between 2007 and 2014. 2 – successful prosecutions of Dark Peak gamekeepers for illegal persecution of birds of prey between 2004 and 2011. 3 – the number of decades between successful breeding attempts in the 1,200 square kilometres of the SBSG recording area (from the 1950s to 1984). 3 – the average number of chicks fledged from the St George’s nest over the last 5 years; also the average number of chicks that fledge from urban nests according to Esther Kettel’s PhD research (cf. average of 2 from rural nests). 3 – the temperature (in degrees celsius) here in Sheffield as I write, following some snow flurries this afternoon, evident in the screengrab below, with the male sitting tight. And finally – 3 – the number of eggs visible as the female takes over incubating duties just now: her bigger body size will be more effective, especially on a cold night. 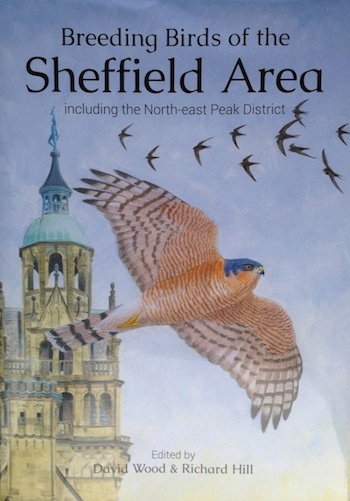 4 – the number of lowland Peregrine sightings in the Sheffield area 1960-80 (so approx. 600 square km). 4 – the number of eggs laid each year by the St George’s pair (and the commonest clutch size in Peregrines). 4 – the number of chicks fledged from the St George’s nest in 2014 (the only year to see all four eggs hatch and fledge, as below). With 5 days to go before the estimated hatching date, I thought a countdown might be fun, Thunderbirds style, together with a few Peregrine-related facts. 5 – the number of years we’ve had chicks fledge at St George’s. Fingers crossed for 6. 5 – Radcliffe’s study from 1980 found 2% of pairs to have 5 eggs (419 clutches); in 2016, by contrast, 9% of the c.145 clutches monitored by the Dutch ‘Nestkalendars’ site had 5 eggs. 5 – the number of Peregrines recorded in the wild in the entire Sheffield Bird Study Group recording area (1200 square km!) in the period 1975-80. Plenty of cause for optimism in those figures. A visit yesterday morning revealed the female perched on the Arts Tower as the male incubated the eggs. Expect both adults to be in attendance most of the time over the next few days, even if not visible on the webcams. Well, after a couple of trips away from Sheffield it’s good to see that all is going to plan with the Peregrines. 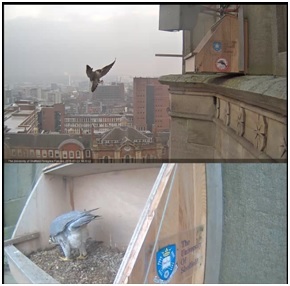 A visit to St George’s this morning revealed the male sitting tight and the female on a nearby building and then on the E side of the church tower, out of sight of the webcams but very much present. She enjoyed a good preening session, making sure those feathers remain in tip-top condition. Last week brought Esther Kettel to Sheffield Bird Study Group’s monthly indoor meeting. She delivered an excellent talk based on her PhD thesis, which explores how Peregrines are adapting to urban habitats and compares their situation with those in rural habitats. It was a really great evening with a lot to learn about these magnificent birds. Hopefully I’ll be able to give an update based on her talk some time soon, but in the meantime one of the standout facts for me was that urban pairs are more successful that rural pairs to the tune of one chick per clutch. When talking about four eggs/ chicks as a typical clutch/ brood, that’s a significant difference. The St George’s pair are part of her sample, and it’s great to know that they’re part of a wider success story. The clutch of four eggs they are brooding is very much to be expected after four eggs every year since 2012 and has followed the pattern of the previous three years very closely, with the first egg laid on either March 19th or 20th and the fourth laid on either March 26th or 27th. So Easter Monday represents three weeks on from the completion of the clutch, with another 10 days or so until hatching might be expected. According to the previous few years’ schedule, reproduced below with this year’s laying dates included, my estimate is that hatching may take place on Friday April 28th, providing for an exciting close to the month. In the meantime there will be a lot of sitting and occasional flurries of activity, but – hopefully – nothing too dramatic. Once the chicks have hatched, we can start to look at doing some of the things that the donations will support, such as DNA testing and colour ringing. It is humbling to see the donations that have come in to date, and we’re very grateful to everyone who has contributed to the cause. Do keep them coming! !